Our Folsom home decor store invites you to browse our collection of unique, affordable decor. Rod Works is passionate about offering our customers quality pieces that will enhance any space in your home, both indoors and outdoors. We are sure that our products will inspire you to decorate your home in a way that will show off your personality and style. From iron pieces to wall art, each piece is special and will give your home that special touch. Visit us today or read some expert decorating tips. Whether you notice it or not, houses are relatively the same. They all have living rooms, kitchens, bathrooms, and more. The beautiful part about a house is it can be transformed into a home. This is where Rod Works in Folsom, CA can help. We provide decor to our customers looking to change their house into a home, creating a unique, special atmosphere in each and every room of their house. What makes a house a home? How you decorate it. Our Folsom home decor store has the perfect end table, shelf, or frame for your living room or bedroom. Have an empty wall-space in your bathroom that you must fill? Tie the room together with a gorgeous decor item. Don’t stare at white walls anymore. Add a touch of style and a splash of personality to any room or space in your house to transform it into a home. If you’re struggling with where to start, you’re not alone. Plenty of homeowners don’t know what to begin with when it comes to home decor. 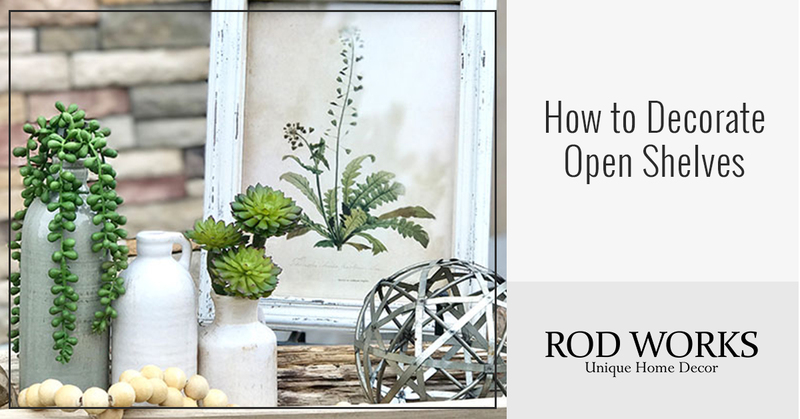 That’s why Rod Works offers a variety of home accents and home decor that will complement your style. Visit the Home Decor Store in Folsom to get an idea of what you like and don’t like. If you’re not sure about your home decor style, you can figure it out while browsing our store. It’s best to simply walk around for a few minutes and take note of what catches your eye and what you feel as though you would avoid. With that being said, you will quickly find that you do have a unique style. You can do this, and Rod Works wants to help! Don’t over complicate your home decor design. Granted, we understand if you have the perfect vision of how your living room, kitchen, and bathroom are supposed to look. In fact, most homeowners browse our store with an image they’ve seen on Pinterest or through a friend’s Facebook or Instagram feed. But keep in mind that a more minimalistic design tends to speak louder than overpowering ones. Not entirely sure how the professional interior designers make home decorating so easy? Don’t be discouraged. You can do this! We understand that it can become overwhelming at times, but the wide selection of home decor at Rod Works provides opportunity for you to create a unique and special home. Remember, keep your design simple; you can add onto it later. The size of home decor and home accent items matter. It can be tempting to simply purchase all the home accent items that show the color blue, but this may leave you with an inconsistently shaped home decor collection. Imagine the space you desire to fill, and think of which items would best fill that space. For example, you want to decorate an office or a study. The room is smaller than the average bedroom, which means large items are going to take up a lot of space. You probably already have a desk and a chair in the space, which takes up enough room as it is. Consider smaller home decor items in general to fill the room. Keep consistent with your style vision, but go with smaller items. This will help make the room feel bigger, offering a spacious feel. Always consider the size and dimension of the room you’re decorating and the decor items you’re filling it with. Remember, home decor patterns and textures do affect how the space is experienced. You’ve considered the style you like, the design that engages you, and various elements that go with great home decor. It’s time to make a decision. Ask yourself if the home decor or home accent items you’ve chosen fit with your overall home design concept. Don’t be afraid to say no to an item you love if it doesn’t work for the space you’re decorating. As much as we want to believe it, home decor experts focus on staying true to their vision. If you want to transform your house into a home, you need to stay true to yours. If you’re having a hard time deciding between one color scheme or another, let us know! Our Folsom home decor store staff are always ready to help you make the tough home decor decisions. What’s more, our staff is professionally trained and available when you need them. That’s why we encourage you to visit our location. Apples, cinnamon, pumpkins, squash, green beans, sweet potato, ham — there are so many fall vegetables and dishes that make delicious tasting, and of course delicious smelling meals. If you haven’t cooked up a delicious fall meal, now is the perfect time! The weather in Folsom is getting cooler, the leaves are changing color, and autumn decor is finding its way into homes throughout the area. If you’ve been craving some warm, satisfying fall meals, we have put together a few of our favorites. 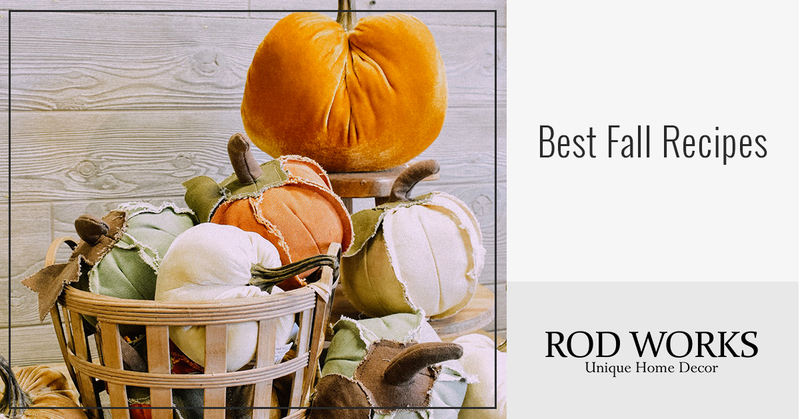 Rod Works is a home decor store that wants to bring each season into your home, whether it’s through our quality decor items or these fall meals! And what’s better than sitting down to the table with your family to enjoy a meal and having the surrounding spaces filled with warm colors and decor that makes the whole scene festive and cheery? Visit our Folsom store for just the decor you need and a few fall recipes! There are so many benefits to serving up this meal, it’s hard to know where to start. How about the fact that you don’t have to use plates? Or the fact that pumpkin is nutritious as well as delicious? Or maybe that sausage is the perfect choice for a hot, slightly spicy meal that warms you from the inside? Or that, surprisingly, these stuffed pumpkins are actually really easy to make? Try it tonight — just don’t eat the pumpkin decor. Cranberries aren’t just for Thanksgiving dinner! The more you use cranberries in your meals, the more you’ll love them. This recipe also combines some more of our fall favorite flavors, including thyme, onion, apricots, ginger, brown sugar, walnuts, and apple. All of these flavors meld together to create a dish that is so full of warmth you may forget about the chilly weather outside. And to complete the scene, sprinkle some cranberry decor around your home. The perfect accompaniment to either of these fall meals is an equally fall dessert — and one that your kids will love. The soft texture of the cake, combined with the smooth filling, as well as the spicy pumpkin flavor is a quick snack that will quickly disappear. And the soft orange/brown color will look beautiful next to your other home decor. We couldn’t write about fall recipes without mentioning an apple dessert. These warm apple dumplings are more than satisfying with just the right amount of sugar and cinnamon. The only thing we ask if you decide to test this recipe out is to eat it with a scoop of vanilla ice cream. The warm/cold combo is exactly what your taste buds need at this time of year. Any change in season welcomes in new flavors, whether it’s pumpkins in fall or strawberries in spring. 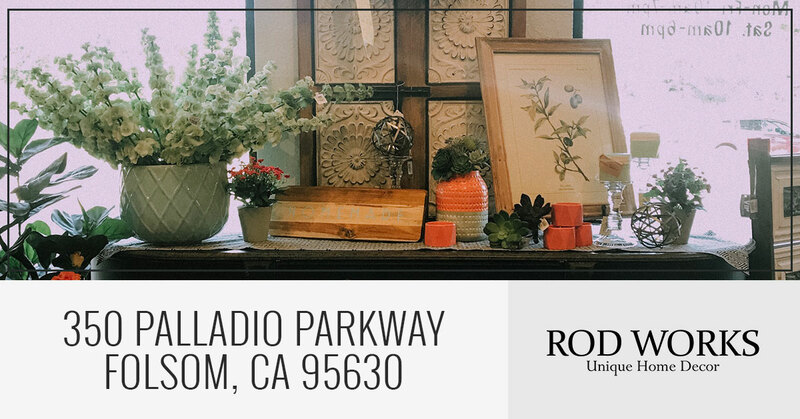 To match the change in season in your home, shop at our Folsom home decor store, Rod Works. We love watching the seasons go by so we can introduce new items into your home and heart. Visit us today! Open shelving has been around for a long time, but using them primarily for decor rather than function is becoming more and more popular. But actually finding and arranging items that can be used to create a super cute shelf can be harder than it sounds. So, whether you have open shelves in the kitchen, living room, or the bathroom, here are some things to keep in mind as you’re shopping home decor stores and finding the best arrangement for them on the shelves. Whether you can’t put books down, you read half of the book and give up, or you never read at all (we’re only judging a little), books and magazines create a sophisticated look in any space and on any shelf. When you’re arranging these materials on a shelf, you can make it as complicated or as simple as you want. Order them by author, genre, size, color, keep them upright or on their sides, or simply keep stacking them as you bring them home. And if you have too many, add in a playful bookend. Keeping plants throughout the home is a great way to add some color, texture, and literal life to rooms. The trick to using plants on a shelf is finding the right plant and the right container. There are plenty of plants that are easy to take care of, such as succulents, or a vase of fresh flowers will add a pretty aroma to the room. Choose a container that either complements or contrasts with the other items; this can include the size, shape, and color of the container. Who says art needs to be hanging on the wall? If you want images to be in a frame, this is another opportunity to look for fun decor pieces, or you can simply rest the picture against the wall. Take some time to filter through your Instagram or Facebook photos and find a few that you truly love, print them out, and you’re set! Putting up art you’ve made, photographs, sketches, album covers, or small canvases creates a smart look. When you or a guest don’t have time to sit and admire your incredibly put together shelf, you need to create interest by choosing and arranging items by height. Look for pieces that are tall, short, and everything in between and don’t just put them together from tallest to shortest. Put a tall vase next to a short figurine, or lay items on their side. You may be thinking that the more color you can cram onto the shelves, the better. However, it’s important to keep it cool with your range of colors. If you do want a colorful shelf, be sure to mix in a few neutrals as well. White, brown, beige, or gray can go a long way in adding dimension to the shelf. And if you want a blue-themed shelf, spread out similar shades so that there is a sense of balance on the shelf. Just like you want a range of heights for your decor items, you also want to think about the size of the item. Vases, planters, books, figurines, candles, containers of herbs, pillows — whatever the item is, using the same size will make the shelf look monotonous and boring. Different sizes lets the viewer’s eye bounce from object to object. A basic rule of thumb for home decor is to only buy it when you love it! You don’t want to be looking at something on your shelf two weeks after you finished the look and realize that you don’t like half of the items. If you’re out there, wandering the aisles of a home decor store, it’s OK, the right piece will find you. 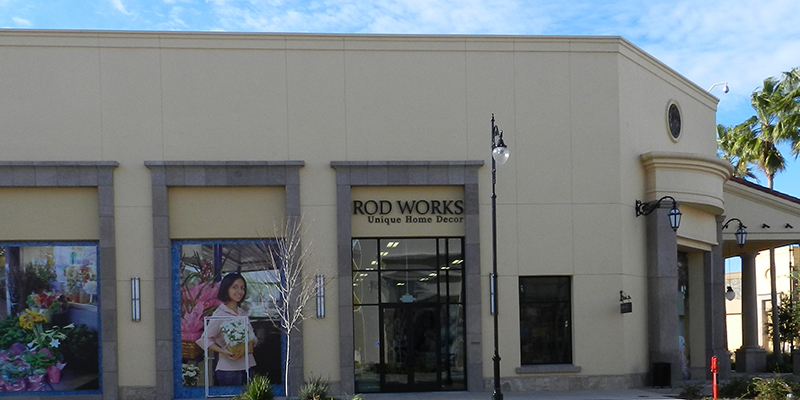 At Rod Works in Folsom, CA, we have a large collection of shelf-ready items. Come visit our store and we’ll help you find a great selection of pieces for your bathroom, kitchen, living room, or bedroom shelf.